Author: Т. Димитрова, 1.1 km From Smolyan. 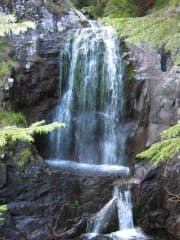 Eco Trail Canyon Falls is a relatively new eco. Is drawn along the river Gerzovska just in itself a canyon that is formed by riolitni rocks. They are very hard rocks, thanks to which defy the effects of water, and thus formed large thresholds, which descend from the clear mountain waters. The starting point The path is near the town of Smolyan, with its highest part is about 1800 meters altitude, and its displacement is about 700 meters. The route passes is six miles, passing through Soskovcheto Reserve, famous for its many rare plant species. The time required to travel throughout marshut is about four hours. 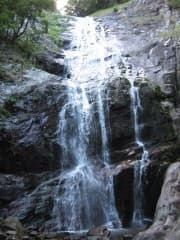 Throughout the transition, you can enjoy the incredibly beautiful waterfalls, where the name comes from the very eco. They are generally forty-six in number, five of which will impress you with a truly impressive proportions. Descending from above you will see the first big waterfall "Ropkata" waters of the waterfall hole carved in the rock, hence its name. Next waterfalls are "told" them after the "Heart" and "Cascade", which seems to pour water on small teraski. The culmination of beautiful mountain streams is the largest and most impressive waterfall in the canyon-Orpheus. Its height is over 68 meters, and its waters are divided into several rucheycheta resemble the harp as the mythical hero. To be enjoyed from a distance as close to the clear waters of the waterfalls were built many wooden bridges. On the whole eco are cozy nooks for relaxation from which you can safely enjoy the beauty of the surrounding landscapes. We recommend you to visit eco-trail in the spring when the foliage is most abundant and the river at high water.